NOSE: Subtle and muddled. A clean, pale malt biscuity aroma and a slightly citric, slightly piney hop profile. Everything is thoroughly blended so it’s hard to detect individual notes. TASTE: As maddeningly balanced as the nose. I hate to say this…but it tastes like “beer”. Sweet caramel and the slightly acidic, bitter tang of citrus hops in the finish. Clean, smooth, and thoroughly unremarkable. DRINKABILITY: Just writing about this beer is making me bored. I suspect reading about it is even worse. Look, it’s a drinkable, tasty beer. There’s just nothing particularly distinguishable or interesting about it. Would I drink it again? Sure. Would I care if I didn’t? Probably not. 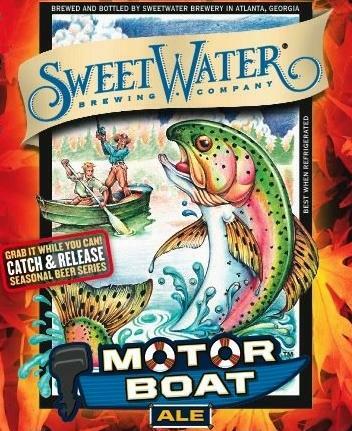 I can see why the Motor Boat was originally Sweetwater’s flagship, then was discontinued, and then was resuscitated. Even the brewery doesn’t know how it feels about the beer. Posted in Tasting Notes.Tagged Atlanta, ESB, Motor Boat, Sweetwater. perhaps your first clue should have been the fishing moniker….noone cares what they’re drinking while they’re fishing…. Sweetwater has never been a brewery known for their subtlety.